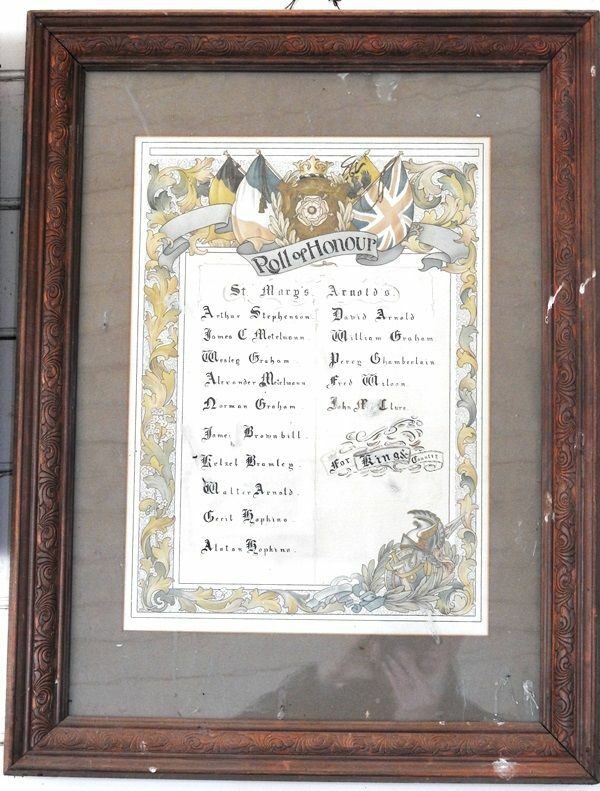 The honour roll is a hand printed illuminated manuscript in a glazed wooden frame and commemorates those who served in World War One. The roll was salvaged from the abandoned and dilapidated old church across the road from the hall. On Thursday evening, 11th inst., a most impressive service was held in St. Mary's Church of England, Arnold, when Archdeacon James, of St. Peter's, Ballarat, unveiled the honor roll and dedicated the pulpit and two chancel chairs, the former being the gift of Mrs. J. C. Metelmann, and the latter of the Arnold Ladies' Guild. The Archdeacon preached a most eloquent and powerful sermon, referring to the congregation as stones, but living stones. Inglewood Advertiser (Vic), 23 October 1917.